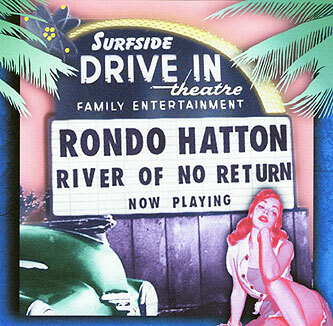 One of the coolest instrumental guitar bands in the USA today, Rondo Hatton released a worthy follow up to their 2012 self titled Rondo Hatton CD. The 2013 CD release of Destination... Fun!! is filled with the same upbeat instrumental surf-rock energy and good vibes that has kept the genre at the top of the guitar world for 55 years. Rondo Hatton guitarist and guiding light Bruce Lamb is in top form on the 19 track CD which features 15 electric surf-rock anthems played to perfection. The electric part of the CD is followed up by four semi-acoustic tracks that brings a definite Latin twist into the surf-rock genre. Featuring several well known, vintage guitar covers such as The Breeze & I and Maria Elena, the Destination... Fun!! CD is a good example of instrumental guitar rock in the 21st century. At the core of the new CD is guitarist Bruce Lamb, whose solid lead guitar work is superbly backed up by his Rondo Hatton band matesJohnny Rossetti (guitars), Les LeBlanc (bass) and Joe Miceli (drums and percussion). Commenting on keeping one of the great American music genres alive and well, Bruce tells mwe3.com, I like playing instros because it is different and fun! People sometimes look at us like we are from Mars, What do you mean you dont sing? Fans of guitar legends, from The Ventures and Duane Eddy, up to and including great 21st century American guitar bands like Insect Surfers, 3 Balls Of Fire and guitar heroes such as Don Leady and Jim Colegrove, will completely enjoy Rondo Hatton. The preeminent American guitar band currently based in and around the Gulf Coast of America, Rondo Hatton pulls out all the stops on their totally rockin Destination... Fun!! Guitar fans: miss Rondo Hatton at your own risk! mwe3: How long did it take Rondo Hatton to write and record the newly released Destination... Fun!! CD? Over what period of time was the music written and rehearsed and how long did it take to realize the concept after the release of the bands 2011 CD which was simply called Rondo Hatton? Bruce Lamb: I started writing the songs about 2 weeks after we finished recording the last CD. They were finished by January 2013. Johnny and I worked up the arrangements and showed them to Les and Joe. We started recording in March but had to back a couple of times to finish it up. We did several percussion and Christy Gandy did all of the strings at a studio in Baton Rouge. mwe3: Why did you call the new Rondo Hatton CD Destination... Fun!! Its a pretty tongue in cheek idea so to speak but the music is really fun and enjoyable and it gets the point across. Its got a kind of very 1960s type title. How does the Destination... Fun!! CD cover art tie into the music and I guess that kind of imagery increases the fun. Who designed the cover art? Fun!! Tim Mueller put the cover together for us. mwe3: The Rondo Hatton lineup continues to strengthen with the new Destination... Fun!! album. 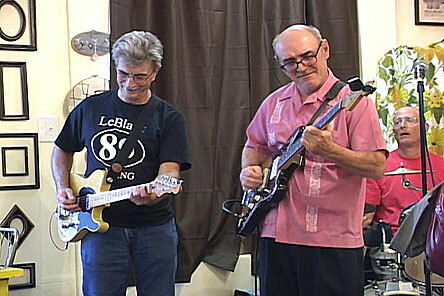 How do you and Johnny Rossetti share the guitar chores this time around and Les and Joe continue to keep a solid groove. How would you compare your two guitars sound on this new album? Is it kind of like the Shadows / Ventures sound with the lead and steady rhythm guitar? Bruce Lamb: Johnny tells me, You write em and Ill hold it together for you. Les and Joe lock on and away we go! I have to take my hat off to them; they will try anything I throw at them. Johnny plays a few solos on this CD, just like he did on the last one. He always sounds so good! On live gigs we feature him on things like Apache and Poor Side Of Town You ask if our formula follows The Ventures, well, they cast the original mold didnt they? mwe3: What was the recording process like for Destination... Fun!! and were there overdubs on the CD? 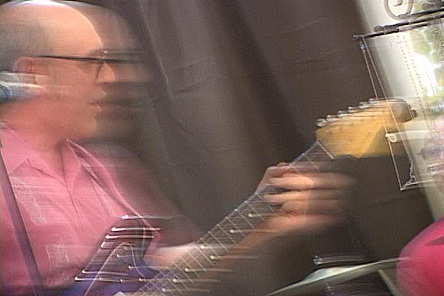 What roles did the Aaron F. Thomas and producer Bill and is there anyone else you can cite as being instrumental during the making of the new album? Bruce Lamb: We went into the studio, set up and played live. Just that simple. We did overdub a couple of guitar tracks, percussion, keyboards and strings. Aaron Thomas has great ears! He is definitely responsible for the overall sonic product. He is also a player so he will say, You can play that one better! He is also a super nice guy. 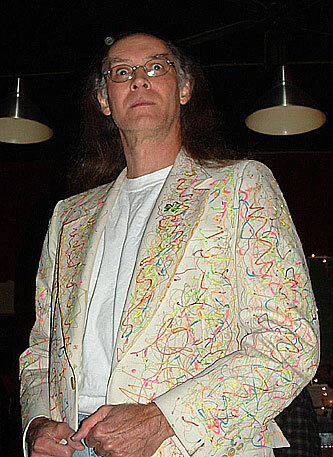 Bill Boelens has been a very close friend for 30 years. He is always full of encouragement and support. He is the one who got us into the KRVS studios. He is an on the air personality there. Chad Solomon was our original drummer and has come back as percussionist. John Smart played piano and organ. He has been a friend for a long time too. Christy Lee Gandy did all of the strings. Very, very talented and one of the sweetest and prettiest ladies you will ever meet. mwe3: You live in Baton Rouge Louisiana and we were talking about the popularity of Rondo Hatton there. How do you like it in Baton Rouge and how would you compare Baton Rouge to other music cities like Austin and Nashville or Memphis? Where else have you lived over the years and can you compare those places as well to Baton Rouge? Bruce Lamb: Ill refrain from any comment about Baton Rouge. 1980s rock cover bands, nuff said. I did live in Austin, Texas for 17 years and I really enjoyed most of it. I got to play a lot, met some great players, and got to work with some true legends. I would move back today, if I thought I could afford to live there. mwe3: How about the guitars, amps and other effects you played during the making of the new CD? What guitars does Johnny Rossetti play on the Destination... Fun!! CD and how about the basses and drums? Bruce Lamb: Well, I dont know what kind of drums Joe plays, but they are a real cool sunburst finish! 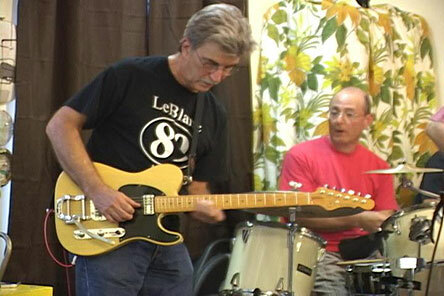 Les plays a Fender P bass but he has a couple of mongrels he has put together as well. 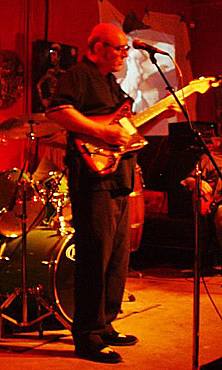 Johnny played a G&L ASAT Classic with TV Jones filtertrons and a Bigsby, a Fender Tele, and a 1968 Gibson 335 through a Fender Deluxe Reverb. 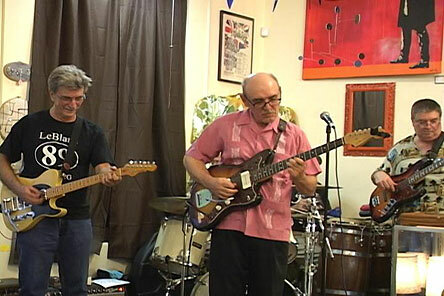 I played a Fender Jazzmaster, a Fitzwell Strat type, and a no name, mystery of the Orient Les Paul copy (on one song) through a 1961 brown face Fender Super with a Boss Fender Reverb pedal. I would like to say, that Johnny and I both use Peavy Bandit 65 amps for live gigs and we are proud to admit it! mwe3: With the resurgence of the entire surf-rock genre in recent decades, what do you like best about playing instrumental guitar-based music and what artists today do you feel are best carrying on that spirit? 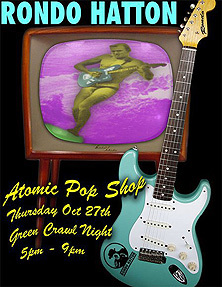 Is there a worldwide surf-rock community and how can it best be united by a single driving spirit? Bruce Lamb: I like playing instros because it is different and fun! People sometimes look at us like we are from Mars, What do you mean you dont sing? (lol) As far as players from this genre that I like, I would have to include Danny Amis and Eddie Angel from Los Straightjackets, John Blair, Dave Wronski, and the guys from The Greaseballs. Im sorry, but I cant remember their names. I guess there is an instro community but, we are kind of on the fringe of that just because of where we are based out of. I will say, I have met some great folks since we got our music out there on the internet and thanks to guys like you who give us exposure. Bruce Lamb discusses the new Rondo Hatton CD Destination... Fun!! mwe3: Thunderbird Beach sounds very Ventures influenced. How would you describe the guitar sound on that track? Bruce Lamb: To me, that song is very South-West, Tex-Mex sounding. That is why we had John Smart put that cheesy Farfisa organ on it. The guitar sounds Big, I guess. A little side note on this one... I played this for a friend of mine and she jumped up and started dancing the Sideways Pony. She said we should make a video with a bunch of gals doing the Pony. Maybe shes right. mwe3: Miramar has a great pre-1963 kind of sound. Lost innocence. Is that the sound you were after on many of the Destination... Fun!! tracks here? What guitars are you featuring on that track? Bruce Lamb: After I wrote Seabreeze for our last CD, Johnny started pushing me to write more pop or melodic type songs, so that is where this came from. 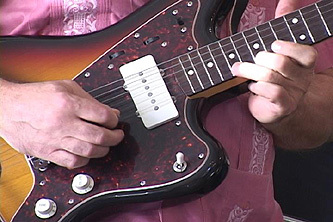 I played my Jazzmaster and I dont remember which guitar Johnny played. mwe3: Leos Rollerland has another one of those late 1950s / early 60s guitar sound. What was the keyboard sounds backing the guitar? What is that spoken word at the end? Please return all skates to the service desk. mwe3: Track 4, Weekend Getaway has a Duane Eddy West Coast kind of big open soundtrack type sound. What kind of tone were you going for there Bruce? And how big an influence was / is Duane in the guitar world in your estimation? Theres also a cool kind of James Burton inspired closing to that track! Bruce Lamb: You nailed that one! I was going for Duane Eddy all the way and Johnny will be very flattered that you think he was going for James Burton. Thanks for the very nice compliments! And yes, Duane Eddy started it all, with Link Wrays help! mwe3: We spoke earlier about the Duke Robillard composition, Cookin which Rondo Hatton covers here. How would you compare the guitar sounds on that track compared to the classic Rondo sound? Cookin sounds almost R&B in scope. Hes pretty underrated! Did you take some liberties with the cover of this track? Bruce Lamb: All of us in the group have real deep R&B backgrounds. We actually moonlight as an R&B band from time to time, but that is another story. We play a lot of R&B instros anyhow (Bill Dogget, Freddy King, etc.) Ive never heard anything by Duke that I didnt like. Hes great! Did we take liberties? Well, I sure cant play like Duke so I did it as close as I could. I think its close to his original. mwe3: Is track 6, The Quiet Surf getting back to the classic Rondo Hatton guitar sound. The guitar interplay is great between you and Johnny. Bruce Lamb: That is a tune by The Fenders. I dont know anything about them at all. I have twp tracks by them on an old surf comp LP. This was one of the two. I think it is a cool song. Kind of Lounge-Surf, I guess. mwe3: Big Mack Attack has a funny name and the guitars are uniformly in attack mode there. What was the M.O. on that one? mwe3: Perhaps the most high profile cover on Destination Fun!! is your new version of Maria Elena You mentioned it was a tribute to a relative of a band member? The song has such a rich history. What inspired the Rondo version? Bruce Lamb: Les LeBlancs mother loved this song and loved our version the best. She was one of the sweetest ladies on the planet! When she passed away, we all agreed we would include it on this CD for her. Ive been playing this song for quite a while. mwe3: Oceanside is another Rondo track featuring the classic surf-rock sound. This will be a future classic and theres some very clean guitar picking and double stops there. What inspired Oceanside? There must be a lot of towns named Oceanside in the US! Fun, were going to the beach on this one. I picked the title out of thin air, honest! mwe3: Track Sagebrush Serenade is something else. Are those real strings there? It almost sounds country & western but theres a cool Duane like guitar break in there. Bruce Lamb: I was going to play this on the lap steel but then decided against that. I thought it sounded sort of Hawaiian but Johnny said it was western so, Sagebrush Serenade. And yes, those are very real strings. That is Christy Lee Gandy playing a first part (3 times), a second part (3 times) and yes, a third part (3 times). She is and amazing musician! The twangy low guitar part is me on a Fender Baritone Telecaster. Bruce Lamb: I got carried away with this one. There are actually 4 guitar parts on this track. I played my Fitzwell Strat for that super wet guitar part. I never play without reverb, no matter what style of music Im playing. I just dont like a dry amp, but I try to be subtle with it unless the song calls for a surfy, wet sound. And yes, you can use too much! mwe3: Theres two versions of Tu Besitos on Destination Fun!! Is that your Tex-Mex influence there? Another future classic. The guitar sound is very varied on the electric version of that track. What effects were prevalent on the electric and can you say something about the unplugged version of Tu Besitos when the track reappears again on track 16? What is the English name? You mentioned sometimes Rondo does shows where the sound is smaller where you cant be all electric? So is that why you put the unplugged Latin music tracks at the end of the CD? Bruce Lamb: Tu Besitos means your kisses. Im a big fan of most Latin music's. I thought I was writing a Bolero, but now Im not sure. Maybe it is a Samba! I dont know if we used any effects on it other than reverb! The unplugged version was cut in Baton Rouge at Jim Taylors studio. He had just gotten some new gear and wanted to try it out so, it was us doing him a favor and him doing us a BIG favor because I think the 4 unplugged tracks came out great. We occasionally work in an all acoustic setting, such as in a small restaurant. mwe3: Did you purposely follow the electric Tu Besitos with the Rondo Hatton version of The Breeze & I. That song has a rich history. Are there strings added there too? How about the keyboard sounds? It adds a nice touch. Whats the connection to The Breeze & I? Bruce Lamb: Well, they just happened to be back to back. No special reason at all. It was my idea for Christy to play the Tempest or Wind lick. I dont know what you call it. I guess it is a scale of some kind. She came up with all the other string parts and John Smart played a baby grand that is in the studio in Lafayette. His part was an afterthought but I am sure glad we added it. This is one of my favorite tracks. I learned this song off of a Jon & The Nightriders LP! mwe3: High Country has a big open sound. Kind of like the theme from Bonanza. Maybe a great single track there. Were you greatly influenced by big western movies soundtracks? Whats your favorite movie soundtrack and composer? Bruce Lamb: No more than anything else, really. I do love Westerns! Besides Pulp Fiction for the obvious reasons, Id have to say The Good, The Bad And The Ugly or Hang Em High. mwe3: Lead Footin is a great way to close the electric part of the new CD. It sounds like a great album closer. Another great choice for a single. Why did you subtitle it The Ghost Of Harding Drag Strip? Any other cool data on that track?  bit, too. Bill Boelens got that car sound from some internet site. mwe3: What made you add in 4 bonus tracks that are sort of surf-guitar unplugged including the aforementioned Tu Besitos. Are are the titles in Spanish and who wrote the tracks? As far as those 4 bonus cuts go, how did you change your approach and does the entire band play on the unplugged cuts? What about what acoustic guitars you play on those tracks? Bruce Lamb: As I said, the 4 acoustic tracks were a separate project but they came out so good we just had to use them. There was no change in the approach. We cut them live though Joe and Chad did overdub additional percussion. Les wasnt available when these were cut so engineer Jim Taylor overdubbed the bass on Tu Besitos and I played bass on the other 3. The titles are in Spanish. All I can tell you is that some guy named Lopez wrote El Trenecito( Little Train). That is all I know. I played a 1967 Gibson J-50 that I have had for over 40 years. I also played a Parocho Bajo Quinto and a cheapo Oscar Schmidt Puerto Rican Cuatro. Johnny played 2 different Guild acoustics but I have no idea what their model numbers are. mwe3: How about the track La Bikina? It has an interesting melody and rhythm while the CD closing Danzon Juarez doesnt even have writers credit. Is that a public domain track? It sounds kind of familiar but I cant place it! Bruce Lamb: La Bikina is a Mariachi waltz I learned from an LP by Frank Corrales, a guitar player from San Antonio, Texas. I plan on re-recording this on a future CD in an electric format in 4/4 time instead of the waltz time. I think it would make a great Ventures style pop tune. Johnny says Im nuts! We could not find the composers name for Danzon Juarez but I do know it was named for a Mexican General Juarez who was a hero in the Mexican Revolution. It has been recorded by many artists and is a standard in Mexico, Texas and the Southwest. mwe3: What is the plan to spread the word about Destination Fun!! and as far as new destinations go, whats the Rondo Hatton plan for 2014? Only six years to 2020. Bruce Lamb: The new CD will be available through CD Baby, i-Tunes and Amazon.com. You can also buy it from DWM Music and Deep Eddy Records. We really want to hit the festival circuit and would love to play in Europe. What we need is an agent!! Anybody out there interested? Weve got a couple of concept CDs in mind such as In A Blue Mood with Rondo Hatton which would be, surprise, blues and we really want to cut an all Latin CD that would be mostly acoustic stuff. Im working on a solo project of all original Surf, Spy, Spaghetti Western stuff plus some choice Ventures covers. Thats about it Bob! Thank you for your help and support.